Our good friends over at TechRadar may have listed the 5 secret things you probably missed at Apple's launch event, but we think they missed one. 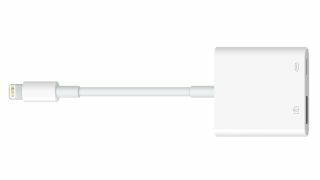 The new Lightning to USB 3 Camera Adapter could be the most significant new product for musicians from Apple around last night's launch event. This new version of the adapter can now be powered by an external USB power adapter, allowing you to connect a whole host of hi-power peripherals to your iPad, including audio/MIDI interfaces, hubs, ethernet adapters and card readers. It will be USB 3 compatible, opening up the doors for newer audio interfaces hitting the market, but only the 12.9-inch iPad Pro will benefit as the new 9.7-inch iPad Pro uses USB 2. The Lightning to USB 3 Camera Adapter is available now for £29, and more information can be found on the Apple website. Update: Devices can be charged whilst using the adapter.